If cycling during a rush-hour traffic jam makes you see red, then a team of Czech companies has an invention just for your niche demographic. 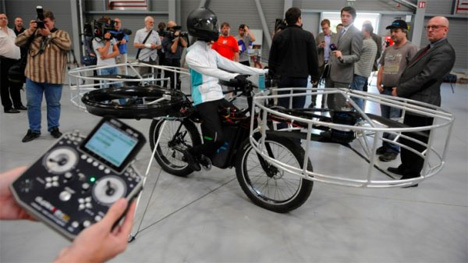 They have created a quadruple-fan propelled, remote controlled flying bicycle. 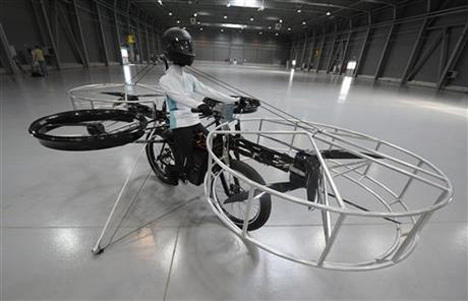 The invention won’t see commercial availability for a long time, as tests show it hovering a mere five feet off the ground, sans passenger. And it can currently only carry 209 lbs. The possibilities, however, are what give this vehicle its sense of excitement. In true Brewster McCloud fashion, it was demonstrated in a fallout shelter-style hangar, where it lovingly carried a Styrofoam dummy around for about five minutes. It’s really loud and really big, but it sure is fun to watch in flight.